The Bratz girls, from left, Sasha (Logan Browning), Jade (Janel Parrish), Yasmin (Nathalia Ramos) and Cloe (Skyler Shaye). The sacrifices of hard-working Janel Parrish and her parents have landed the former isle girl a starring role in the movie "Bratz"
The traditional red carpet will be pink for Janel Parrish and her co-stars as "Bratz," the live-action film based on the controversial and hugely popular high-fashion dolls, opens Friday. "Pink is the signature Bratz color," Parrish explained as we caught up by phone last weekend. It's been four years since her parents, Mark and Joanne, sold their streamside dream home in Kaneohe and moved to Los Angeles so she would more available for auditions and other opportunities. It was a big move. Not only did it mean leaving behind longtime friends, but to maximize her availability for auditions, rehearsals and a demanding schedule of professional training (singing, dancing, acting and piano), her parents decided that she would be home-schooled. Parrish's hard work, and her parents' sacrifices, paid off big time this year when she was cast as Jade in "Bratz." She got the role after going to two auditions and then to a call-back several months later. "I was pacing my room, waiting. ... And when I got the call that said I got the part, I just started screaming." And now she'll be part of Bratz history forever. "I always thought (the dolls) were adorable, and that they were really cute. ... We met with the woman who created the dolls and she told us about why she created the dolls, and I love them even more. She wanted each girl to have a doll that she could relate to instead of having one perfect All-American doll," Parrish said. "They're coming out with 'Bratz: The Movie' dolls. They're the same Bratz dolls, but they're a little more like us." Parrish had done a considerable amount of television and stage work while still living in Hawaii, and much more television and film after moving to L.A. Even so, she says "Bratz" was "unbelievable." Janel Parrish was a busy young performer. 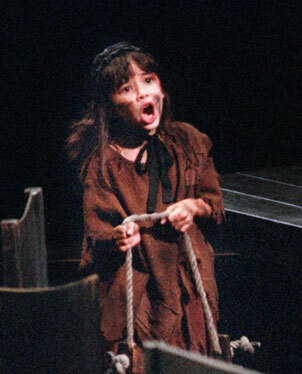 Among her many theater roles, was her role as young Cosette in "Les Miserables" in 1996 at the Blaisdell Concert Hall. For the benefit of those untouched by the Bratz phenomenon, the four stars -- Parrish (Jade), Logan Browning (Sasha), Nathalia Ramos (Yasmin) and Skyler Shaye (Cloe) -- represent the diversity expected in most contemporary films for teen and 'tween audiences: Yasmin is Mexican American with an awesome voice who suffers from stage fright. Sasha, African American, is a supertalented cheerleader whose parents are divorced and don't speak to each other. Cloe, Caucasian, plays soccer better than most guys; her mother is a single parent. Jade, half Caucasian and half Asian, is an outstanding student who enjoys a secret life as a cutting-edge teenage fashion designer. The foursome drift apart after they enter Carry Nation High School and become involved with different groups -- the cheerleading squad, soccer team, science club and so on. They also run afoul of the resident tyrant, super-rich witch Meredith Baxter Dimly, the student body president. Parrish says it was "a really, really fun movie to make." "(Jade) was a dream role for me 'cause I got to sing, I got to dance and I got to act, and I got to play a really cool character. She's very funky, she's a fashion designer -- she designs all the clothes she wears, and all the costumes that the girls wear in the talent show, and the scene where we're dressed up as catering clowns, Jade does all that (too) -- so I get to wear some really cool clothes." Although some adults fear that the original Bratz dolls are too sexual for preteen girls, the movie is squeaky-clean throughout -- except for the food fight that is a key scene. "We had an amazing time filming that. It took about two days. It was disgusting and messy, but it was so much fun. We got so into it. The director would be calling 'cut' and we'd still be throwing food." Food fights, slapstick and sight gags aside, "Bratz" is also a major showcase for her solo career as a recording artist. The music-video version of "Rainy Day," a song she wrote and recorded, shows during the credits. It will also be included on the "Bratz" soundtrack album. A solo album is also in the planning stages. For now, however, Parrish is promoting "Bratz," posing for photos here, signing autographs there and being interviewed by an ever-growing list of newspapers, magazines and electronic media. Personal appearances in New York and Canada will be followed by a trip to Europe. "It's very exciting. 'Bratz' is big all over the world. The movie comes out Aug. 3, and 'Bratz 2' is in the works. I don't know much about it, but I'm very excited."